Dorothy R. Kearns, of Lockport, NY entered into rest on December 4, 2018 at the Newfane Rehab. She was born in Buffalo, NY on August 14, 1923, the daughter of Walter and Kathryn (Falkowski) Korczynski. She was the widow of Clifford J. Carlson (1953) and Eugene P. Kearns (2012). Besides her parents she was predeceased by her brother William Korczynski and sister Mary Dudek. Mother of Elinor (Steve) Stone of Newfane and Clifford (Kathy) Carlson of Lockport; grandmother of Scott Stone of Lockport, Matt (Amy) Stone of Central Square NY, Laura Carlson and David Carlson both of Lockport; great grandmother of Alyssa and Natalie Stone and Zoi Re; sister of the late William Korczynski and the late Mary Dudek. She is also survived by sister-in-law Peggy Kearns. 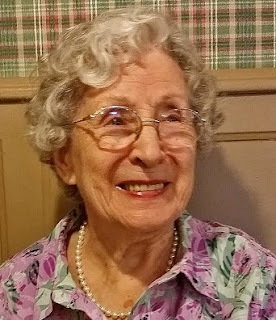 Dorothy enjoyed working in the Kearns the Printer business, owned by her husband and her, as the bookkeeper and especially as liaison with clients for Wedding Invitations. Relatives and friends may call Friday, Dec. 7th from 4-7 PM in Prudden & Kandt Funeral Home, 242 Genesee St., Lockport. A Mass will be celebrated Saturday, Dec. 8th at 10:30 AM in the Holy Mother of the Rosary Cathedral National Catholic Church, 6298 Broadway, Lancaster. Interment will be in the Holy Mother of the Rosary National Cemetery. Donations to a charity of one’s choice would be appreciated. Visit pruddenandkandt.com.